For companies with an established pattern of growth, the SEC requires the position of chief financial officer (CFO) to be disclosed as a top five executive in the annual proxy filing. Additionally, the CFO holds significant sway over the financial well-being of the company, especially in the eyes of shareholders. For shareholders, the CFO could potentially be viewed as “second-in-command.” It is not unusual for the CFO to transition to the CEO role, though it is not the most common prior position for a CEO. An analysis by Korn Ferry in 2015 found that 13% of CEOs entered that position from the CFO role, while executives who previously held senior –level financial roles made up 18% of CEOs. The Korn Ferry study makes the case that a strong relationship to the board, along with structured understanding of the company’s financials, may place the CFO in a unique position to assume the reins of leadership. Nevertheless, there are also questions about how well a CFO can function as “first-in-command”. The Korn Ferry study argues that so-called “people skills” are just as crucial in a CEO: managing conflict, developing strategy, driving growth and managing finances. Similarly, an Acuity Magazine study cites John Stevenson, a CFO at Wellard Limited, who served as both CFO and CEO. Stevenson explains: “Taking risks is not something accountants normally do. That was something I had to learn.” Acuity Magazine further notes how Stevenson had to “use intuition, gut feel, and merge that with [his] financial background.” More direct communication with shareholders and employees is also absolutely vital in a CEO role. 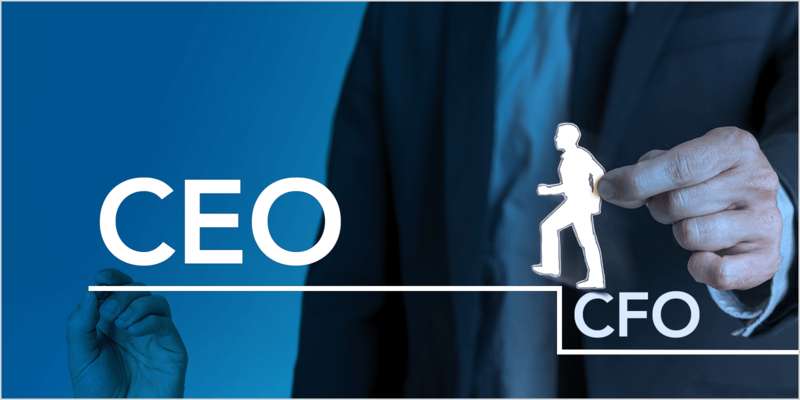 A 2016 Deloitte study parallels these findings: the ideal CFO-turned-CEO should understand “vision, engage with people throughout the organizational chart and be “continually seek[ing] ways to broaden their cognitive and behavioral repertoire.” This individual must be prepared for the wide variety of experiences that comprise the responsibilities and skills of a CEO. The average number of such transitions in the Russell 3000 over the last five years is 25, while the median is 29. While there is not a clear trend to the data by year, we can delve somewhat deeper into the type of transitions that took place as well. The study additionally looked at whether the transition was as an interim CEO or directly to the position of CEO. In addition, these transitions are broken down by both average company tenure and sector prevalence. 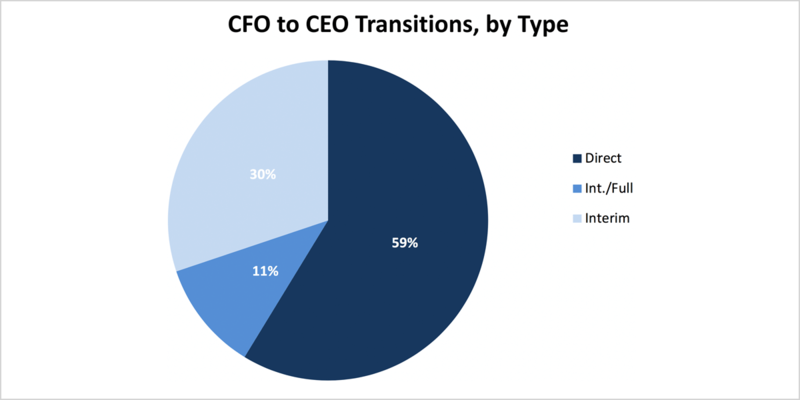 Over half of companies (59%) in the Russell 3000 that had CFO-to-CEO transitions tended to promote their CFO directly to the CEO role. This would suggest, perhaps, that succession plans were already firmly established at these companies. 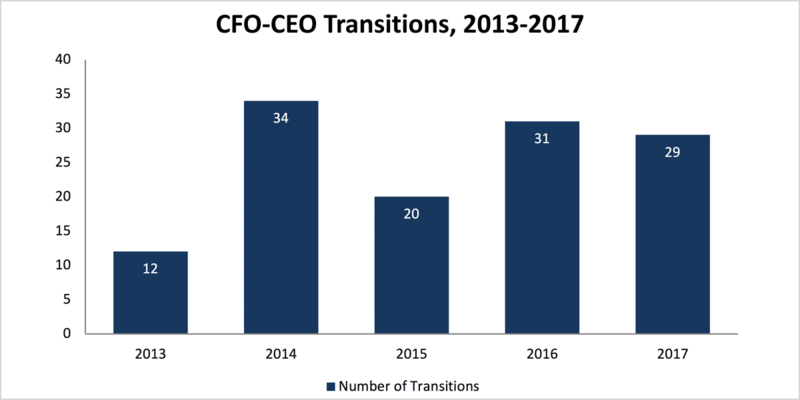 30% of these transitions, on the other hand, consisted of a promotion from CFO to interim CEO, yet only 11% were transitions from CFO to interim CEO, and then on to full-time CEO. It could be that companies have pre-established policies in which their CFOs assume an interim role while an external search takes place. On the other hand, it is also possible that the interim period serves as a “trial run” to test the CFO’s capabilities as a CEO. The fact that 89% were either direct transitions or strictly interim roles might instead imply that Russell 3000 companies have one of two different CEO succession plans: either they firmly believe their CFO has the skillset necessary to succeed as CEO and choose promotion straight to CEO, or the CFO does not make the jump from interim CEO to CEO at all. The polarized outcomes might exist for a number of reasons. 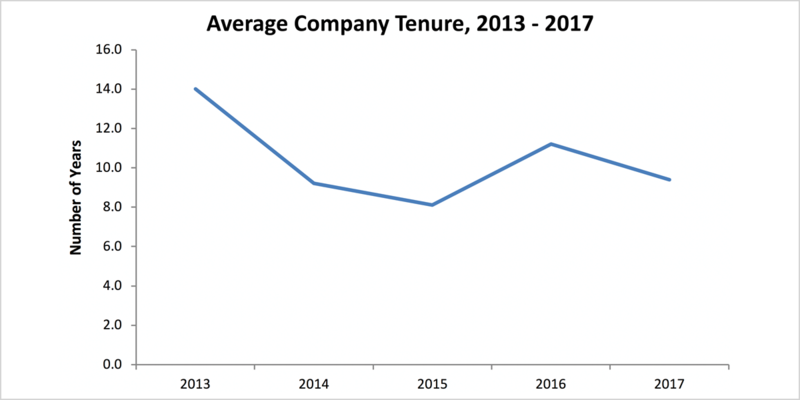 The average company tenure of the CFO-to-CEO has declined throughout the past five years, from 14 years in 2013 to 9.4 in 2017. The average tenure over that time frame was 10 years, while the median was a bit lower at 7.7 years. It seems that companies are more willing to promote longer-tenured CFOs to the CEO position, perhaps as they become more aware of transferable skills and have more experience with the company. Nevertheless, the slight downward trend over the past five years might suggest that companies are becoming more apt to trust their CFOs in the CEO role. One out of every five CFO-to-CEO transitions occurred in services sector, while the financial and technology sectors ranked second (16.8%) and third (15.2%), respectively. 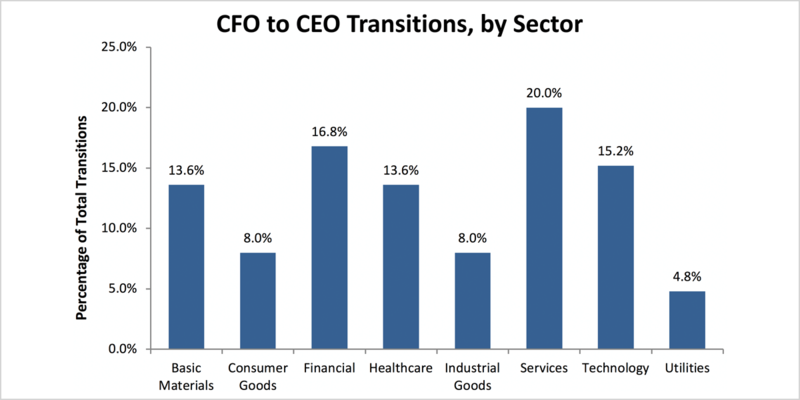 The utilities sector, on the other hand, had the fewest transitions from CFO to CEO at 4.8% of all CFO-CEO transitions. Consumer goods and industrial goods sectors are second and third, respectively, at 8%. The conclusion that might be drawn from the above bar chart is that CFOs in the services and technology sectors are more capable of assuming the reins of leadership, given their background and tenure with the company. In contrast, it is possible that in the consumer, utilities, and industrial goods sectors, boards seek a successor with more thorough knowledge of operations. This may be the chief operating officer, or it may be an external candidate. Regardless, the CFO’s realm of expertise appears to be more suited to leadership and management in the services and financial sector. When a company’s CEO position is vacant, a possible choice for a successor is to choose the next CEO from among current executives in the C-Suite. One potential option is the person most familiar with the financial circumstances of the company. The pivotal role that the CFO plays does not necessarily make them suited to a CEO role, however. The extent to which boards choose to appoint their CFO as either the interim CEO or the CEO is dependent upon how well they believe their CFO can adopt the specific skills of the CEO: versatility, crisis management, and leadership traits, among others. 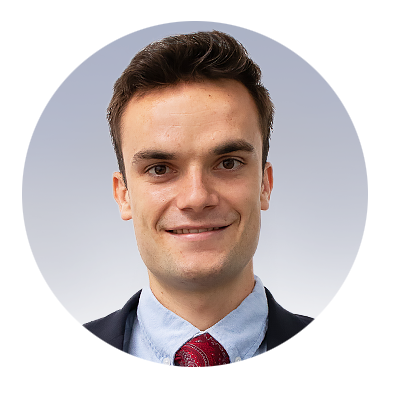 Joseph Kieffer, Research Analyst at Equilar, authored this post. Please contact Amit Batish at abatish@equilar.com for more information on Equilar research and data analysis. 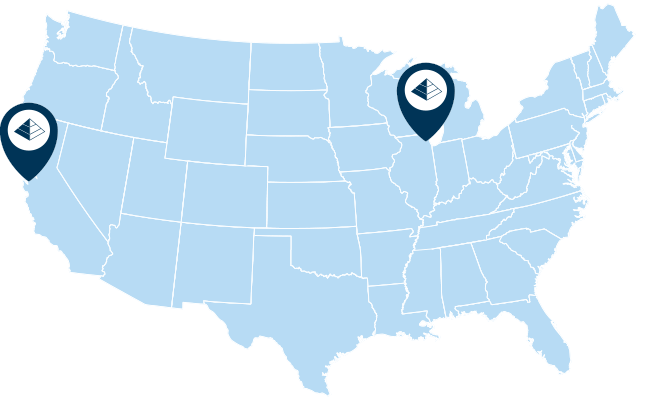 Subscribe to our Newsletter to stay informed about upcoming events and webinars. If you'd like, we can send our newsletters straight to your inbox. Press the "ESC" key or click the "x" button at the top right to exit.